The good news is that I have found a way to have the cake and eat it too. This cake is not only sugar-free, it is gluten-free as well. Soak the almonds and walnuts overnight in separate bowls. Drain and set aside. Slice the berries in with the bananas. In a food processor combine the almonds with dates and vanilla. Combine until well mixed. Form into equal size rounds and set aside. In a blender combine the soaked walnuts, the sweetener and water until it is creamy. You may need more water if you have a less powerful blender. Place a cake round on your plate, add some berries and bananas and then pour some cream topping over. Place another cake round on top and add as many layers as you would like. 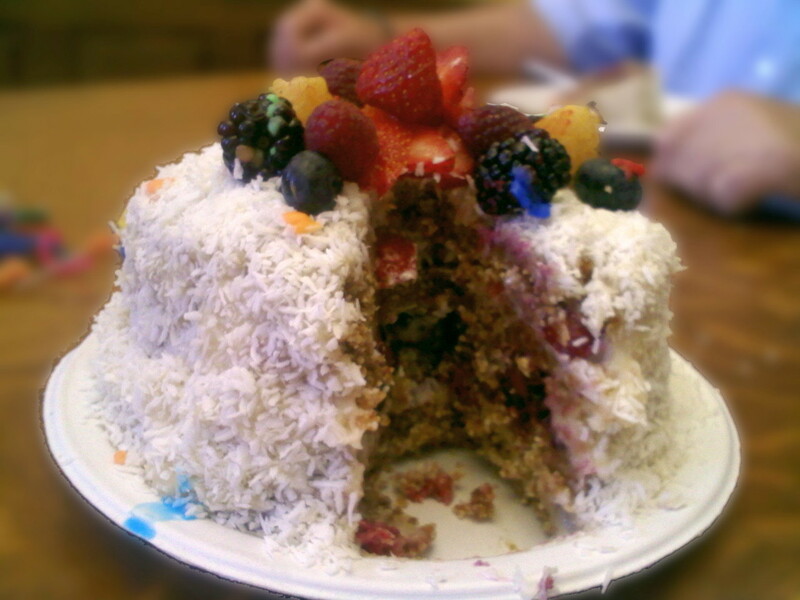 Cover with coconut and place a whole berry on top to make it look pretty. I have a confession to make. I have a sweet tooth, or maybe a mouthful of them. I say this because my recipe book has a dessert section larger than the entrée section. When I was researching a healthier lifestyle, one of the assumptions that kept coming up was that sugar is bad. I’d heard that for years, but no one ever shared with me why it was bad or how to eliminate it from my diet. I wanted to have my cake and eat it too, without all the negative consequences. Refined sugar is addictive. This is the reason you’ll find it in almost every prepared food you buy, including some canned and frozen vegetables. It sounds audacious to say that refined sugar is a drug, but the difference between a sugar molecule and one of cocaine is just a few nitrogen atoms. So if sugar is so bad, why do I have such a large dessert section in my book? Well, I replaced the refined sugar with natural sugars. There are many alternative sweeteners that are natural unrefined sweeteners and are usually lower on the glycemic index, which measures blood sugar levels. Some of my favorite sweet things come from nature including bananas, dates, raisins and unrefined raw honey. Honey is made by bees and contains small amounts of nutrition. Agave nectar is the juice from the agave plant with trace elements of potassium calcium, iron and magnesium. It is a little thinner than honey and low on the glycemic index. Coconut palm sugar is made from the sap of coconut palms and dried into crystals and is also low on the glycemic index. Coconut nectar is also made from coconut palms but it is extracted as a liquid and is more comparable to maple syrup thickness. Stevia is very low on the glycemic index and is made from the Stevia plant. Artificial sugar sweeteners should never be used. They are unhealthy, and the chemical sweeteners are often toxic to the body. They are approved for consumption by the FDA only because they won’t kill you immediately. Controlling blood sugar levels is the best way to prevent type II diabetes, which is a chronic disease related to sugar in the bloodstream.